Receiving flowers, whether they are sent from another person or you bought them for yourself, can give you an immediate mood boost. A bouquet of flowers is a sign that someone cares for you, and being well-thought of can do a lot for a person’s well-being. A pretty flower bouquet with bright colors and a soothing scent can brighten a room and your mood at the same time. Many people have a moment where they completely lose their train of thought. Keeping plants in indoor spaces may help with concentration and memory; plants oxygenate the air, boosting your brain cells and making you feel more like your best self. You can opt for a bouquet, or go for a longer-lasting plant, such as Teleflora’s Peaceful Zen Garden, a combination of bamboo and easy-to-care-for succulents in a brown bamboo container. These plants only need water once a week and grow quickly, making them entertaining, as well as good for supercharging your brain. There is a reason so many stressed-out people turn to gardening to combat the blues; not only is the experience of growing things cathartic, but floral scents can do a lot to lower stress. Bring home a sachet of something soothing like lavender or chamomile and feel your troubles melt away. Even a fresh sprig of rosemary may help with headaches and tension. Before you know it, you will find yourself feeling like your best self. There is a reason people give flowers as gifts to patients in the hospital; yes, it’s a nice thing to do, but it may also help a patient heal faster. Frequently, hospitals include access to green space for recovering patients because simply looking at plants every day helps stressed people feel more relaxed. A relaxed person in the hospital typically heals faster than someone who is stressed out. Give a sick friend a major boost with a bouquet like Teleflora’s Make a Wish, a combination of multi-colored daisies, purple asters and red and orange carnations topped off with a bow. They will feel better in more ways than one. 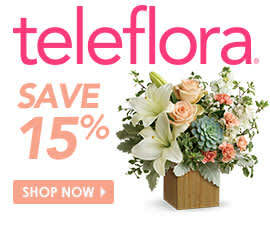 You can find many soothing scents and beautiful bouquets Teleflora.com, so try a few out and see what works best for you!